Around 25 colourfully dressed people gathered with placards to march through the main street of town and past the local markets. 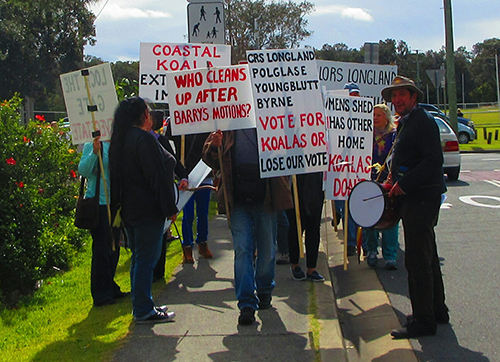 The protesters carried signs with slogans calling for protection of koalas at Black Rocks for the sake of our children, demanding that a Men’s Shed find a different home other than in the middle of a koala corridor, critical for the survival of coastal koalas, and warning certain councillors that if they didn’t vote for koalas they would lose our vote at the next election. They chanted ‘No Men’s Shed at Black Rocks oval,’ ‘Lock the Gate, Revegetate’ and ‘Save Black Rocks Koalas’ accompanied by drums, cymbals, tin whistle and accordion. Alice, a hand-crocheted art piece made into a puppet/beanie (now on her 8th protest) was there and a number of stuffed koala toys that adorned people’s bodies. All of the protesters were over 50 years old coming from a range of professions and included a physician, an author, wildlife carers, a councillor, a book publisher, an artist, a physical education teacher, an electrician, a business studies teacher, a nurse - including retired Black Rocks residents -hardly your typical protesting types. But these people were upset enough about what is unfolding for koalas at Black Rocks to give up part of their Sunday on a beautiful sunny day to speak up. What were they upset about? 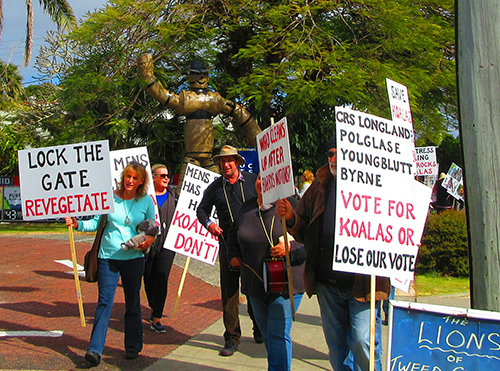 Four councillors (Barry Longland, Carolyn Byrne, Warren Polglase and Phil Youngblutt) voted 21st May, 2015 to remove the last protection Black Rocks koalas have i.e. the gate at the entrance to the sports field. There has been a long history of hooning and vandalism at the sports field creating stress for the koalas and then at Christmas last year there was a major fire that (according to ecologist and national koala expert Steve Phillips) may have wiped out 30-60% of their population and destroyed over 200 ha of the Pottsville wetlands. What the koalas need most is more protection, not less. By removing the gate these four councillors went against the recommendations of Council’s Koala Advisory Committee responsible for developing the Plan of Management to save coastal koalas first by not locking the gate 24/7 (as recommended) and secondly by removing the gate altogether. These four councillors then voted for council to progress a development application for a temporary Men’s Shed right at the Black Rocks sports field when they already had a permanent location offered to them (Barry Shepphard oval) and are currently in a suitable temporary location at Pottsville primary school. However one of the protesters’ biggest concerns was that of fire – having an industrial-like facility which uses and stores flammable and explosive commodities in the middle of a koala corridor when there has already been a major fire recently. Wouldn’t council want to eliminate the risk of fire, not promote it? The Men’s Shed would be situated a mere 20 metres from the very bushland where koalas live. If there was a fire due to vandals breaking into the Men’s Shed a fire could start and not only wipe out the remaining koalas but force firemen to fight fire on three fronts – not to mention the threat of Black Rocks residents losing their homes to fire. The Black Rocks koalas belong to one of three source koala populations on the Tweed Coast and if the stressors which are driving them to imminent extinction are not removed, the fate of coastal koalas is doomed. For all these reasons and more, these people felt the need to take to the streets with their concerns. There was a very supportive response from passing traffic honking their horns and from pedestrians, many of whom were taking videos of the march on their mobile phones. If you are concerned about the survival of coastal koalas please write to those four councillors and come to the next NRG rally Tuesday August 6th from 3pm – 4pm in front of council chambers prior to the council Planning Meeting where council will probably vote for or against a Mens Shed at Black Rocks sports field. I saw your letter in the paper saying there was a protest on Tues 6th. It was not clear whether this meant Tues 4th Aug or Thurs 6th Aug. There is no Tues 6th Aug. I have been trying to attend koala protests, went to one supposed to be at Surfers a long time ago, but it had been cancelled. Would have liked to attend this latest protest at Tweed, but again, the details of correct time and place are impossible to find out. Left a message on a web page, but no response.